The face of higher education in the United States is rapidly changing. Although the country has long been known for its diversity, these days more and more of the students studying at American colleges and universities are not themselves citizens – at least not yet. For international students, the United States is the land of (educational) opportunity, and every year more and more students are taking advantages of the country's unique offerings. In fact, more than 600,000 international students studied in the United States in 2010, an increase of 3% from the previous school year and a number which represents fully 4% of all those enrolled in the country’s higher education programs. Still, if the facts on the ground are clear, the question remains: why are so many students traveling to the US to further their educations? Excellence is the answer. With nearly 5,000 universities divided amongst its 50 states, students can be guaranteed a fine education in the field of their choosing. More to the point, America is home to some of the best institutes of higher education in the world. Home to fully a quarter of the top 200 universities in the world, students who study in the US have the chance to study with the some of the greatest minds in science, technology and business. It is business, in fact, that draws the greatest number of students. In fact, business has topped the IIE's report for the past decade, with only engineering a close second. 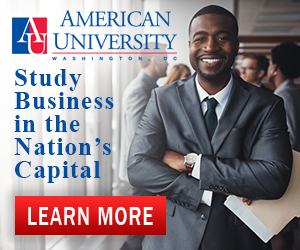 Why study business in the US? Evidence suggests that students flock to the business colleges of America's great universities because they see the strength of these programs as the best preparation for a good job both in the United States and at home. Home country is another strong factor in these statistics. The high numbers of students from China and India, the top two countries of origin and two of the world's fastest developing economies, greatly influence the overall results. Because a rapidly growing economy will provide strong employment opportunities for students trained in the United States, a student from India or China is prone to study at a business college because they will see an immediate return on their investment. Of course, the question “why study business” is, for many students, just part of the story. American universities, like American firms, cast such a long shadow on the international business stage that they reach beyond the textbook. English has become the lingua franca of international trade. As a result, an English-language business education in seen as good preparation for the increasingly competitive global economy of the future. Even students who speak English natively are drawn to American schools in an effort to get a leg up on the competition. After all, a candidate who uses the conventions of American English stand apart when applying for work of conducting business with the United States and may even have the opportunity to network with business professionals or intern at major corporations while pursuing their studies. In the end it is this desire for competitive advantage that gets to the heart of the matter. Given their desire for success, the popularity of business colleges among international student is reinforced by the fact that the schools drawing the most international students are the very same ones with the top business programs. Considering the ever-growing number of international students studying business in the US, it is safe to say that this is no fad.